I've also been here--one of my favorite places in the world--my grandparent's cottage. It was the first time we spent the weekend with Griffin there and we had the most refreshing time. Looooooove this place! Griffin teaching Daddy how to build a fire--or so he thought. Nothing cuter than a little boy in a life jacket hugging his Daddy. While we were there, we celebrated our sixth anniversary. 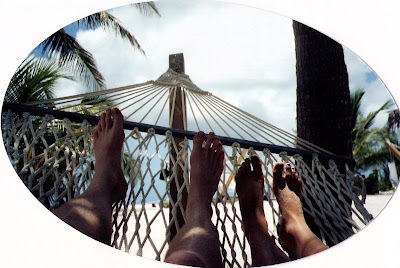 Here we are, six years ago, laying in a hammock on a beach in the Bahamas (sigh). Happy Anniversary, Baby! Six down. Sixty to go! 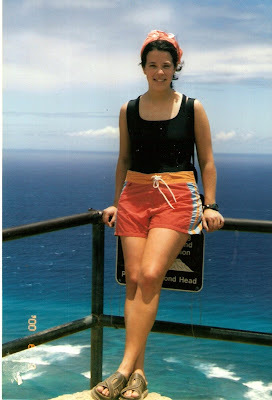 And I've been here--hanging with my girls. This is (part of) my dive group from Elevate (our youth group). They also spent a night at the cottage with me as our last hurrah. Seven out of eight of them are graduating this year. Love you, girls! Who knew it would come up so early? I certainly wasn't prepared for it. But there was no dodging it. The Boy had to be answered. Out of the blue, the other night, Griffin asked The Question. "How did Baby Bob (his nickname for the baby) get in Mommy's tummy?" Wes and I turned to each other, each waiting for the other's response. I gave him the "this-one's-your-territory" knowing glance. So, Wes just dove right in. "Well, Griffin...you see...God did it." Good answer, Wes. Next time won't be so easy. I think we may have a few years before we have to get down the nitty gritty though. We asked Griffin the other day who his girlfriend was. He answered, "Karis (his cousin)." Oh boy. But then he continued. "Ethan (his other cousin). And Todd (his uncle)." Looks like the whole dating thing isn't much of an issue yet. We took Griffin to meet Baby Bob (did I mention that's not his real name? just thought I'd clarify) yesterday. 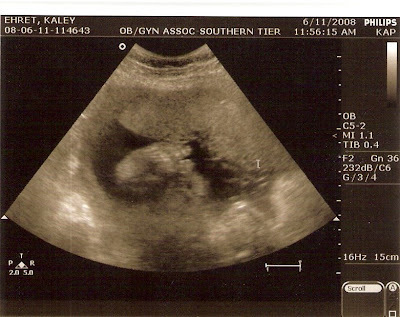 I had an ultrasound and we thought it might help him grasp the concept that there really is a baby in there. He was quite intrigued. But gotta be honest...he was more intrigued with the rubber gloves that the ultrasound technician gave him as he was leaving. He proudly announced that he was going to go home and work outside with them (gardening) and he did. Griffin was a little distracted. cozier in there for him. Piggie pics are my fave. And one more for the road just because it's so darn cute. Griffin's friend Daniel is spending the day with us. 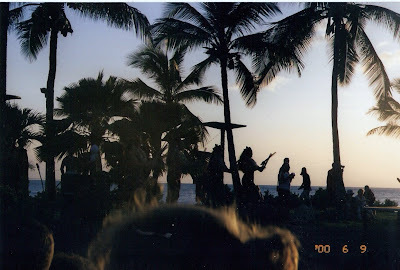 and going to a luau with my friend, Amilee. Just thought you oughtta know. Wes and I often talk about how spoiled we are to have a bevy of family and friends nearby who are quite frankly at our beck and call when we need a babysitter. I recently finished a semester of Making it Count presentations and would like to take this opportunity to express some long overdue words of gratitude and praise. I would never have been able to take this job on were it not for a group of fabulous people who willingly and faithfully looked after our little cherub. At times the mornings were early, some days were long, but I know Griffin was well-loved and cared for. Would you join me in celebrating some of my personal heroes?